Braise yourself for this delicious brunch idea! Get your protein, veggies, and whole grain carbs all in one neat little tower of goodness! This recipe, brought to you by Mitch, is simple and nutritious. To make your own braised eggs in bell pepper nests, simple slice up your favourite coloured pepper into strips straight across the middle. Heat up a large non-stick pan on medium heat and coat with olive oil or cooking spray. Place pepper strips in pan and allow cut edge to brown before flipping. Crack an egg into each pepper and add a dash of hot sauce, along with salt and pepper. After a minute, add one or two tablespoons of water to the pan and cover. The steam will help cook the eggs from both sides, preventing them from becoming too tough! Steam until desired firmness. Serve on top of a toasted English muffin with extra hot sauce on the side. Optional: Add thin strips of onions, mushrooms, and other veggies to the pan and cook alongside bell peppers; toss in fresh kale to steam with eggs. 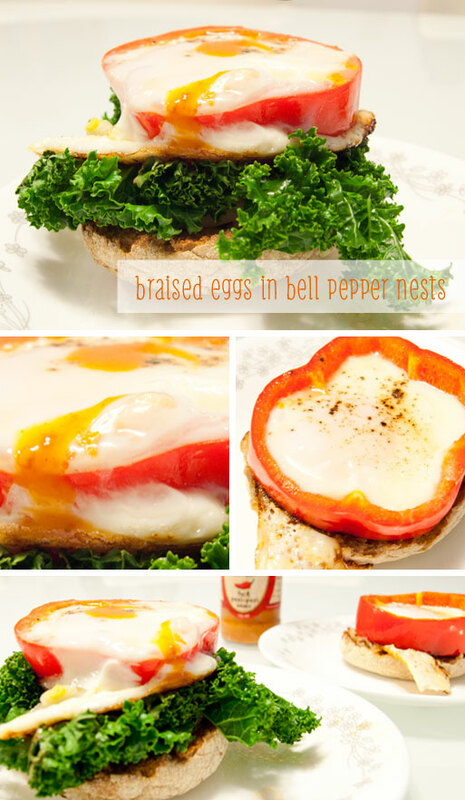 Layer all of the above for some well-stacked braised-eggs-in-bell-pepper-nests muffins. All images copyright © 2012 Jasmine Habart.